Home Content Type PowerShell SharePoint SharePoint 2010 SharePoint 2013 SharePoint 2016 How to Get Content Type ID in SharePoint using PowerShell? How to Get Content Type ID in SharePoint using PowerShell? A typical usage of Content Types is reusable metadata in SharePoint. At times, You may need to get content type id by name in order to assign the content type to lists and libraries programmatically. Lets get content type id in SharePoint 2013 using PowerShell. 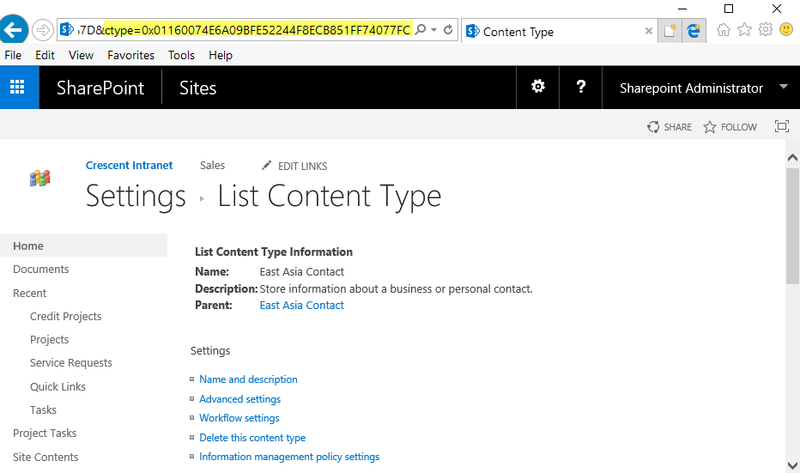 How to find content type id in SharePoint List? In the List Settings page click on your target content type under "Content types" - Assuming content types are enabled already. Same procedure applies for Site content Types as well. Go to Site settings >> Site Content Types >> Pick your content type >> The URL will have "Ctype" parameter with the content type ID of the respective content type. Here is the SharePoint PowerShell to find content type by id. How to get a content Type by ID?